Now that I'm 28, knocking out things on my Before I'm 30 list are becoming more and more daunting! That's a lot of stuff! And one of them, gambling at a gaming table, has been something I've been too timid to try. I was in Las Vegas for a full week in March, and I still didn't have the guts to try it. Even last Christmas with my Dad playing at Harrah's in NOLA I wasn't brave enough. Well, I'm headed back to Sin City in June with friends and figure this is a PRIME opportunity to give it a try! Worst case, I lose a little, but I gain the experience. That said, I like hanging on to my money, so I wanted to do my homework. My Dad is pretty good at poker and blackjack, but without him there to sit at the table with me, I figured the web is a good place to start. Since I did succeed at winning a little at video poker during my last Vegas trip (and I played a little Texas Hold'em in college once or twice), I took a look at How to Beat Your Friends at Poker as a start. 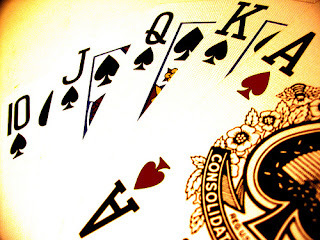 (If you're a true beginner, make sure you check out what a good hand in poker means! Video poker taught me a lot about this.) I like that unlike Blackjack where each hand is a quick bet, with a hand of poker you get to play a little longer for your money as the cards are dealt. The article is a good guide to reading the other people at the table, who will no doubt be trying to take this rube's money. The other guide I liked was the Starting Hand Guide. I remember in college I often folded because I was too afraid to hang onto a hand. I have a feeling my first table gambling experience will be in Las Vegas, probably at the MGM Grand where I'm staying. But if I could choose anywhere, I'd be living out my Vesper Lynd Casino Royale experience in Monte Carlo! Maybe I'll hike down the Strip and go fancy at a table at the Venetian or Bellagio... or even Caesar's Palace. Anyone have some advice for me as I brave the big-kid tables? I'm nervous I'll chicken out, but it's a bucket list thing! Let me know your favorite Las Vegas casino for gambling and maybe I'll check it out in June. This post is in collaboration with Elizabeth Bridges of Slope Interactive.